Whether you envision an intimate gathering of just those closest to you on a stunning Kaua'i beach such as Hanalei Bay or Shipwrecks, a dreamy tropical garden ceremony at Smith's Tropical Garden or Na ‘Āina Kai Botanical Gardens or you dream of a full on fairytale at the Grand Hyatt Kaua'i, Sheraton Kaua'i or St Regis Princeville, I would love to capture the emotion, intimacy and scenery of your wedding. Whatever the picture you have of your perfect day, I believe that each moment of your wedding is sacred and I would be honored to tell your story. Let’s get in touch and create something beautiful together! Your elopement story is as unique as you are as a couple and can range from a quick and simple exchange of vows on the beach to a full day of adventure. We can spend all day hiking to an epic waterfall, to the bottom or the top of the Grand Canyon of the Pacific - Waimea Canyon, climb up to a narrow ridge of rock looking down over the breath-taking Na Pali Coastline or travel around the island, capturing portraits in all the top spots for maximum variety. As an avid hiker I would love to help you dream up the perfect adventure! There are endless stunning spots to elope on the paradise that is Kaua'i, and so many other amazing elopement locations in the Hawaiian Islands. Ask about adding a video slideshow combining highlight clips, images and music! In the end, all that will truly matter are the experiences you said "yes" to, the moments you laughed, and the people you loved... let's capture them! For those adventurous couples who want their proposal, engagement, anniversary or trip of a lifetime memories and photos to be on a whole other level! This is the perfect opportunity to “treasure the dress”! We love exploring new places and believe that behind the lens of a camera is the best way to do it. Do you dream of saying your vows under a waterfall in Iceland? On a cliff in Yosemite? Gazing out over the velvet cliffs of the Isle of Skye, Scotland? Against the turquoise lakes and snowcapped mountains of Banff, Canada? We will capture every piece of the magic in photos and on film so you can share your grand adventure with everyone back home. Let's add a stamp to the passport and create a wedding day beyond your wildest imagination! To elope, most literally, means to run away and to not come back to the point of origin. I love the idea of running to something to say your vows. Gone are the days of eloping meaning a drive through chapel in Vegas or teenage lovers sneaking away. Elopement is now a huge trend in nuptials and people are using the term to describe all kinds of small weddings — both spontaneous and pre-planned. Couples are not running away to get married secretly, they are running away from traditional weddings and receptions and running toward adventure, intimacy and epic destinations. Eloping allows you to focus on what matters most, and to decide for yourself what that is. It allows for a deeper intimacy and for a couple to be more authentic to their true selves. Elopement just rocks!! And Kauai is arguably one of the most epic places to elope in the USA. Get in touch and we can chat about my favorite spots and what type of ceremony and scenery you envision! The Garden Island is like nowhere else on earth! The oldest and northernmost island in the Hawaiian chain, adorned by velvet green valleys, towering mountain spires and jagged cliffs, tropical rainforests, winding rivers and cascading waterfalls; Kauai's views are beyond your imagination. Coupled with a treasure trove of outdoor activities from kayaking the Wailua River, snorkeling Poipu Beach or Tunnels Beach, hiking Kokee State Park or the famous Kalalau Trail, ziplining above the scenery from the Jurassic Park movies, mountain tubing with Kauai Backcountry Adventures or a helicopter ride to the "weeping wall' of Wai'ale'ale Crater - the wettest spot on earth, this island paradise is the ultimate wedding and honeymoon destination. 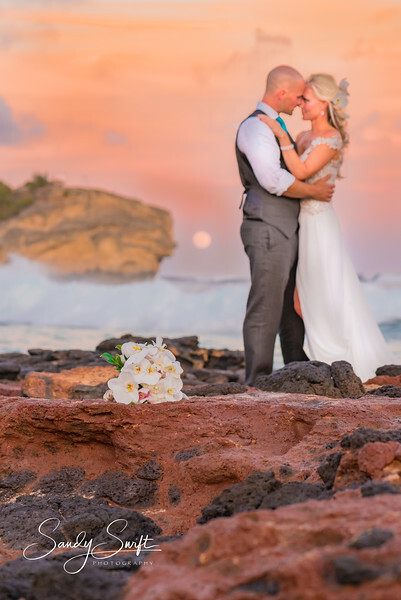 With a prime location in front of Shipwreck Beach in sunny Poipu and some of the most breathtaking Kauai Wedding Venues, an experienced staff, incredible cuisine, the experts at Grand Hyatt Kauai Resort and Spa can curate your perfect dream beach wedding. Click here to see a complete guide of their wedding services, venues, menus, and more. Positioned amidst rustling palm trees with views of the crystal-blue ocean on the shores of Kauai, Sheraton Kauai Resort is a stunning location for a beach wedding. Providing several outdoor Kauai Beach Wedding Venues, a variety of reception options and truly delicious dining, their knowledgable staff will tend to every detail of your big day. Click here for more information about all they have to offer. Positioned on the calm waters of Hanalei Bay and boasting incredible views of Bali Hai at sunset, this luxury resort offers ceremonies under the canopy of a kamani tree, or grand affairs in a ballroom open to the sea. Click here to see how their wedding celebration consultants can help you realize your dream wedding. The majestic Kaua'i Marriott Resort offers venues adjacent to Kalapaki Bay or for a more tropical feel, the Wailele Terrace (Waterfall Terrace), atop two waterfalls and offering a unique Hawaiian feel with Tiki torches and a spectacular Banyan tree that provides shade from the sun. Click here to see how their skilled wedding planners can personalize and coordinate your big day from start to finish. With 25 acres of lush grounds featuring garden courtyards and tropical lagoon pools, Aqua Kauai Beach Resort offers a variety of indoor and outdoor event spaces designed to accommodate both intimate ceremonies and grand affairs. Click here to let their professional staff create an event tailored to your dreams. Perched high on an emerald-colored cliff The Westin Princeville Ocean Resort Villas is the perfect place to celebrate an intimate Hawaiian Kauai wedding in the garden by the waterfall terrace or with the panoramic Pacific Ocean views overlooking Anini Beach below. Click here to have their experts create a truly unforgettable experience for you. Imagine standing on the bluff overlooking Hanalei Bay, the waves crashing on the beach below, the mountains rising out of the bay—nothing could be more romantic. the perfect venue for an intimate Hawaiian wedding. Click here to let their coordinator planning your magical event. Boasting breathtaking oceanfront views and one of the best sunset viewing areas on Kauai, The Beach House can provide the perfect Island backdrop for your very special day. Click here for more details about this little gem. This lush, tropical paradise encompasses 200 acres of solitude surrounded by majestic cliffs and unparalleled beauty. The garden is home to nearly 20,000 living plants and the largest collection of native Hawaiian flora in the Pacific. Click here for information on your Hawaiian topical paradise wedding in the mist of a secret waterfall or the grandness of their Big Valley. Na ‘Aina Kai Botanical Gardens and Sculpture Park is not just one venue but a myriad of unique locations, the gorgeous seaside venue at Kaluakai Beach, the cool canopy of the Hardwood Forest,a picturesque waterfall cascading into the Ka'ula Lagoon with an arched bridge to Hula island. Click here to have this exquisite venue create your special occasion. This open, spacious, and picturesque property has been a top destination for weddings on Kauai since its historical plantation days. Renowned for old-growth trees, tropical greenery, and ocean views, the resort has hosted countless weddings. Click here to explore the options for this charming venue. Nestled among award winning orchid gardens and tranquil koi ponds, and is just a few steps away from gorgeous white sand beaches, a hidden gem on the sunny, south side of Poipu. Click here for information on booking at Plantation Gardens, a perfect venue for a casual yet elegant Hawaii wedding. For those wanting a waterfall wedding without the hike. A private road through the jungle leads to the Waterfall and a tropical path provides a natural aisle that opens to this stunning waterfall surrounded by flowering plants and immersed in the rich lushness of Kauai's North Shore. Complete your wedding with some beach photos as you leave. Click here for details on your Kauai Waterfall wedding dream. The Island of Kauai is home to Mount Waiʻaleʻale (why ah lay ah lay), often spelled Waialeale. Its name literally means "rippling water" or "overflowing water". The mountain, at an elevation of 5,148 feet, averages more than 452 inches of rain a year. As a result this epic little island is home to a LOT of waterfalls! Which is good news for those dreamy of a fantasy waterfall wedding in paradise. The bad news is that the majority of these gorgeous waterfalls are at the end of a hike of varying levels of difficulty. For those of you envisioning an easy access waterfall venue for your guests to enjoy, fear not, there are a few options available and I'd love to chat with you about your choices! Contact me! The Island of Kauai is home to Mount Waiʻaleʻale (why ah lay ah lay), often spelled Waialeale. Its name literally means "rippling water" or "overflowing water". The mountain, at an elevation of 5,148 feet, averages more than 452 inches of rain a year. As a result this epic little island is home to a LOT of waterfalls! Which is good news for those dreamy of a fantasy waterfall elopement in paradise. There are options available for all hiking abilities and I'd love to chat with you about your choices! Contact me! For brides and grooms who want to include beloved family and friends in your destination wedding celebration, you'll want a beach with plenty of parking and easy access for elderly loved ones and children. Consider Hanalei Bay, Shipwrecks Beach, Anini Beach and Anahola Beach for the extra access they offer. For the adventurous couples looking for a more secluded feel for their private vow exchange there are plenty of off the beaten track beaches we can trek to! Contact me to chat about your options! If you drive North on Kaua'i, about 3o minutes past Hanalei, across old fashioned one lane bridges and beyond the reach of cell phone service, to where the road comes to an end, you find yourself at one of the most amazing beaches on an island full of amazing beaches. With the beginning of the famed Na Pali Coastline rising beside you and some truly stunning sunsets, this is one of the dreamiest easy-access elopement locations available. The drawback to all this beauty is extremely limited parking, making this a spot for intimate elopements rather than full blown affairs. This North Shore gem boasts a golden sand beach with a backdrop of lush jungle and spectacular mountains, plus beautiful sunsets, making this a picture perfect elopement spot. Tunnels Beach is very popular with snorkelers and beach goers alike so it lacks a private feel and parking is a challenge, often the only option is to park at Haena Beach Park and walk 10 minutes down the beach to the most picturesque spot. It's hard to image a location more iconic for a Kauai beach wedding than Hanalei Bay. Made famous by George Clooney’s movie “The Descendants” and voted one of the most beautiful places on the planet... Hanalei Bay is like no place on earth... The magical emerald mountains, veiled in mist and cascading with waterfalls... The Historic Hanalei Pier stretching 340 feet out into the calm, turquoise blue sea... Gorgeous sunsets... ahhh - paradise!! Paradise does come at a cost though; you certainly won't be alone in Hanalei bay. But, oh the beauty! The North Shore of Kauai is home to Anini Beach, featuring the longest and widest fringing reef in the Hawaiian Islands and therefore generally provides calm waters. Golden sand, black lava rock platforms and beautiful views, plus a much less crowded feel make this a great choice for your Kauai Beach wedding.